It is said that in order to truly appreciate a creation or a product, one must go back in time and take a look at its history. For example, you could never appreciate the ingenuity of your smartphone if you did not know about the earliest phones and how they paved the path for these modern day inventions that we carry around in our pockets. 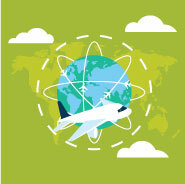 With cell phones, we have seen rapid progress or development in a short period of time. That is not the case with every marvelous product out there. In fact, some products were built so perfectly that they were able to stand the test of time and remain in use for more than a century. A prime example of such a product would be the French Press coffee maker. To say that the French Press coffee maker is unique would be a huge understatement. It is very unlike any other coffee maker available in the market today. All the other coffee makers that we make use of in our homes, offices, restaurants, schools, or universities seem to rely on advanced technology to brew the perfect cup of coffee. Yet, there are a lot of people in the world who prefer the old fashioned and antiquated French Press coffee maker over the modern day products in the coffee maker industry. There is no fancy state-of-the-art technology that goes into the creation of the French Press coffee maker. There are no contemporary synthetic materials used to manufacture this wonderful product. It is a product that stands on its own and delivers in its own exceptional way. Not all the coffee lovers in the world are fans of the French Press coffee maker. However, there are very few people who can deny the fact that the French Press coffee maker is a one-of-a-kind and once-in-a-lifetime creation that has ruled the coffee maker industry for an incredible number of years. Over these years, the French Press coffee maker has made coffee much more delectable for all of us and put a smile on the faces of the true coffee connoisseurs. Before we delve into the history of the French Press coffee maker, it is important for us to understand why this coffee maker is so unique and how delightful its working mechanism really is. Did you know that this old-school brewing device goes by a lot of different names? In fact, this coffee maker has a multi-lingual list of names. Press pot, coffee plunger, cafetera Francesca, Melior pot, Bodum, stanfutto, and cafetiere à piston are just some of the many names which are used to refer to this splendid coffee maker. The large variety of its names gives away a lot of information about its history. A product can only have multiple names if it has remained popular for a very long period of time. Also, a product such as a coffee maker adopts multiple names when it has been used by people of different countries and nations. 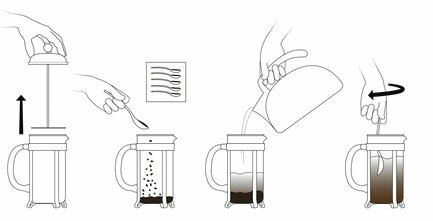 The French Press method of coffee brewing is very simple. The basic idea is to brew the coffee by placing the coffee and the water together. There is a plunger in the coffee maker which can be pressed to trap the coffee at the bottom of the container. This container resembles an ordinary beaker, which gives you a small idea about how simple the design of the French Press really is. Regardless of its simplicity, the French Press coffee maker is incredibly effective. The fact that it does not use electricity is what makes it even more impressive. There aren’t too many coffee makers in the market today that can run without electricity. One of the most frequently asked questions about the French Press coffee maker is “Why are coarse coffee grounds used when making coffee in a French Press?” The common answer that you will receive from people is that it is a traditional practice to use coarse coffee grounds for the French Press, since it is an age-old brewing device. This answer is partly correct and partly erroneous. The reason why it is correct is because coarse coffee grounds have always been used in the French Press coffee maker. However, the fact that they are still being used today has nothing to do with tradition or convention. There is a very simple reasoning behind the coarseness of the coffee grounds. The plunging mechanism of the French Press coffee maker makes it necessary for the coffee grounds to be coarser than the ones used in other coffee makers. In fact, the coarsest coffee on a coffee grinder’s gauge is used for the French Press. If you were to use fine coffee grounds, then they would simply seep through the mesh of the plunger and mix with the liquid, thus ruining the taste and texture of the coffee. The last thing you need is a distasteful cup of coffee after doing all that hard work with the French Press. This just goes to show you that sticking with tradition instead of coming up with your own innovations can be the smarter option at times. 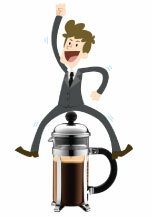 There are a lot of things that make the French Press coffee maker stand out. The exquisite, freshly brewed coffee that comes out of it is one of them. What makes the French Press coffee so different from any other variant of coffee? Well, the answer lies in the flavor of the coffee itself. 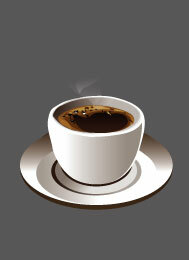 The casual coffee drinkers are usually not much concerned about the flavor of the coffee that they are drinking. All they are looking for is the caffeine boost that will keep them up and running for the greater part of the day. However, it’s a different story with the coffee lovers. Taste and flavor are the first priorities of someone who loves to experience the unfiltered, uncontaminated, and unadulterated pure flavor of coffee. The French Press certainly does not disappoint, in terms of flavor. In fact, it would be fair to say that the flavor of French Press coffee is arguably the most delectable of them all. In French Press coffee, the coarse coffee grounds are in direct contact with water. This creates the rich and intense flavor that people love to enjoy. The strength of the French Press coffee is determined by the amount of ground coffee that is used every single time. If you want to take the strength of the coffee up a notch, then you simply have to use more ground coffee. As long as you can serve the coffee right after pressing it, and not let the coffee grounds seep through, the cup will not turn bitter, and the taste of the coffee will remain fresh and rich. Let us get down to the business end of things. How exactly was the French Press coffee maker created and where did this brewing device originate? We have to go back nearly a century to trace the origins of the French Press coffee maker. At the beginning of the 20th century, an Italian man by the name of Attilio Calimano filed a patent for the coffee press in the year 1929. It should not come as much of a surprise that Calimano was a designer. 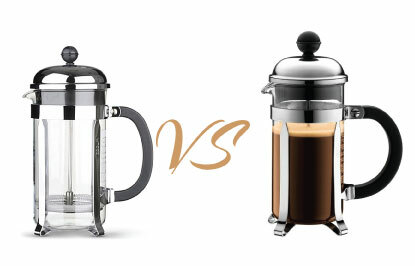 No wonder the French Press coffee maker showcases perfection in terms of functional design. The original design of the French Press coffee maker underwent alterations as the years progressed. Perhaps there were a few defects or faults with the version that was created in 1929. This created room for other designers to improve the French Press coffee maker and give it their own touch. Among all the designers that tried to associate their names with this historical brewing device, Faliero Bondanini was the man who was able to achieve success in this endeavor. 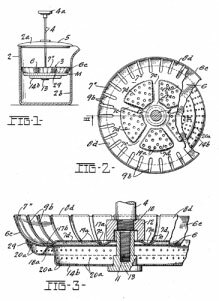 He went on to patent his own version of the coffee press. This patent was filed and approved in the year 1958. Much like his predecessor, Faliero Bondanini was an Italian. 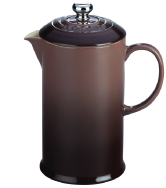 From the mid-1950s to the early 1990s, the French Press coffee maker went through a period of transition. Societe des Anciens Etablissements Martin S.A. was able to distribute a brand of French Press coffee maker known as the Chambord in different parts of Europe. The French Press coffee maker was given different names in different parts of Europe where it was being used. That is the reason why it has a long multi-lingual list of names. It took a while for the French Press coffee maker sales to expand all across Europe. Once the distribution was carried out effectively and successfully, this brewing device became a household European name. The principal investor and manager of Martin was Louis James de Viel Castel. 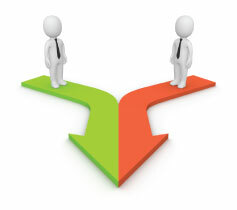 This man was a highly accomplished entrepreneur who had numerous businesses to his name. One of the firms that he owned was called the Household Articles Ltd. This was a British firm that sold a French Press coffee maker called the La Cafetiere. La Cafetiere and the Chambord were the two leading French Press brewing devices at the time. Unsurprisingly, the manufacturers of these two exclusive and unique products were always butting heads with one another in order to emerge victorious in this two-horse race and take control of the coffee maker market in Europe. Though both the parties were highly competitive, it cannot be denied that there were a number of similarities between the Chambord and the La Cafetiere. In the year 1991, all of Martin’s assets were acquired by a Danish tableware and kitchen company that is known by the name of Bodum Holding. This acquisition did not deter Louis James de Viel Castel from pursuing his ambitions and dreams of making the French Press coffee maker a big hit. He insisted that the French Press coffee maker remain in the production line. He came up with the plan of facilitating its sales through his company Household Articles Ltd. An agreement was made with Bodum Holding that restricted him from selling French Press coffee makers in France under any labels (including the trade names such as Chambord and Melior). Not only was he barred from ever selling another French Press coffee maker in France, but he was also prohibited from distributing the product through the channels that Martin had used during the 1990-1991 period. Things turned out fantastic for Bodum Holding. To this day, this massive company has remained one of the major purveyors of coffee makers. Their brewing machines are sold under the Chambord design and name. In fact, if you go through the catalogs of French Press coffee makers, you will find a plethora of such brewing devices that are branded as Bodum Chambord. Over the last decade or so, the Bodum Chambord label has transformed into a symbol of excellence, reliability and high quality for people who are eager to spend their hard-earned money on a state-of-the-art French Press coffee maker. 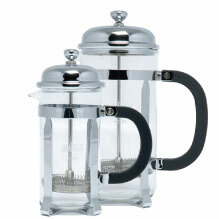 The French Press coffee maker is one of the most well designed and marketable kitchen appliances of all time. The passage of time has done little to wear away the charm of this marvelous product that is still being used today in millions of households across the world. It might not be the fastest or most precise way of making coffee, but it surely adds a touch of sophistication to your everyday coffee. This coffee maker is here to stay, and it will continue to evolve in exciting ways for customers to enjoy. In time, we will see French Press coffee makers being crafted with better manufacturing materials that have improved resistance to temperature changes. We may even see the introduction of stronger glass composition to prevent staining or clouding. What is really interesting about the history of the French Press coffee maker is that it was never truly a French creation. The French Press coffee maker is primarily an Italian innovation that was adopted by the entrepreneurs in France. So, the next time you are enjoying an intensely flavored French Press brewed coffee, be sure to thank the Italians for their unbelievable creativity, stunning simplicity, and immaculate attention to detail. I have been going back and forth on whether or not I want to buy a French Press for a long time now, and after reading your article, I’m sold! I also love know that it didn’t actually come from France.